Just a regular small walking picture, from a strip taken before WW2. But one of the two gents has written in pen on the back “Corporation Street, Birmingham” and the date, 1936. So this is the first confirmed walkie I have from this large city, which would have been almost impossible to identify otherwise. Urban walkies are much less common than seaside ones, so it’s good to be able to add another to the growing list, although we will probably never know much about the photographer or indeed the people walking along a very busy street on that Friday lunchtime 80 years ago. More in hope than expectation I had a look to see if I could discover what the site looks like today, but needless to say being Birmingham NOTHING remains from this entire view. There are just a few old photos to show us how fabulous it once looked like. And it’s no good blaming the War, the city still attacks its architectural heritage ignoring wiser advice, witness the great modernist library they ripped down recently. Philistines. Probably best mates of the same idiots in charge of destroying Sheffield. Skeg Cards (from Skegness if you hadn’t guessed!) have been documented on the site before but this particularly nice example came my way recently. Sometimes a walkie just catches your attention, and this is one such. The young girl just looks so excited to be both on holiday and having her photo taken. I cannot make my mind up whether the couple are her parents or perhaps Grandparents. They look a little austere at first glance but once you get past the gent’s now deeply unfashionable moustache, he is on the verge of a smile and his partner appears to have just realised what is going on. Technically it also stands out, with the trio highlighted against a misty faded background. I suppose it’s possible someone in the darkroom spent a few seconds “dodging” to increase the contrast, but it is likely to be a happy accident. The image was marked “unknown” when I bought it, but the view looked familiar. Sure enough the large building behind them is the old Pier Hotel at Skegness. If that wasn’t enough, the girl is holding a holiday regulation wooden spade but also an unusual metal seaside bucket, more like a small milk pail, and this has the words “Present From Skegness” printed on the side. Skeg cards were in business from around 1920 and took walkies near and on the town’s first pier. They did not mark their cards, but the neatly hand written reference number jotted down is typical of their output. I imagine this must be circa 1924 or so. More potential customers can be seen behind them, in what looks to be the early morning. He is dressed down, no tie and white shoes, but the older woman, smothered in a huge fur stole of some sort, is not exactly beach ready so I assume the next port of call was to hire a deckchair before sandcastle building could ensue. This would have been a great walkie originally, but then someone young has been let loose with the hand tinting set and this garish image is the result! At first I assumed the little girl was the woman’s child (and perhaps the guilty party!) but having looked more carefully I think there is actually another adult hidden behind her, holding the dog lead and a pink basket. The image is post-WW2 but looks older, and I cannot make out where it was taken although the level ground around the cliffs near Margate might be a possibility. I played with the mono levels and you can begin to see the original image below. Most walking picture firms offered a professional hand tinting service but I have seen very few of these, perhaps the price put people off plus most people bought these on impulse, and would not have wanted (or been heading home) to wait for them to be coloured. There are some proper examples in the Go Home On A Postcard book! 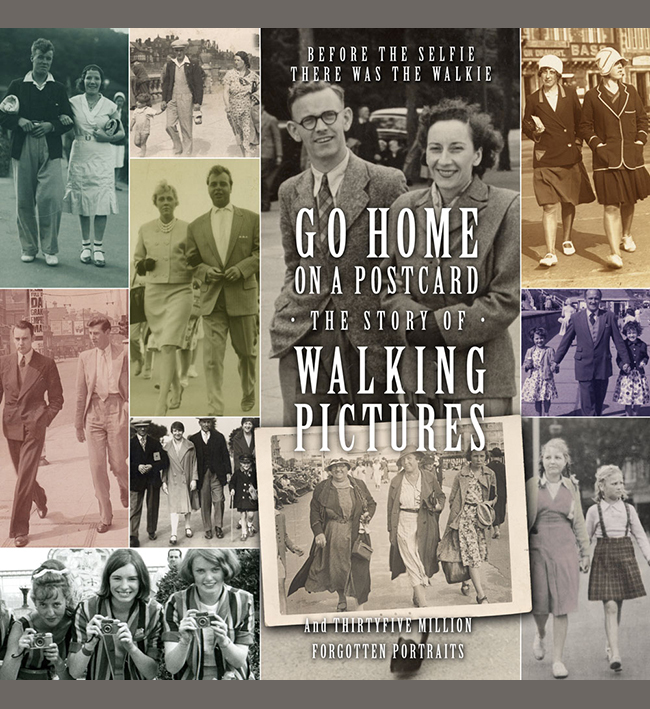 Most walking pictures date from the early 1920s onwards, with just two in my archive from before WW1. This looks to be a third. The card is very faded and frustratingly has no location or indication of which firm took it. Not does it carry the usual reference number, just a regular postcard printed back. But it clearly is a commercial walking picture from the composition and the way the woman is looking with curiosity at the camera, he waving his stick in the general direction seems to be trying to ignore it. The dating comes from her fashions, and also his collar. Being so early, it is before negative numbering had come into use on walking pictures, and the couple were probably just informed where they could see the print on display later in the day (maybe in the kiosk in the background), and did indeed go and buy it. It’s not a brilliant image but that’s mostly because it probably wasn’t processed as well as it could be, so it is now a very pale sepia colour which I’ve had to work on in Photoshop to increase the contrast. The view has a south coast feel to it, but the depth of field is quite shallow so everything behind the couple is very out of focus. If the area looks familiar to anyone do get in touch! There is a hi-resolution version in the Go Home On A Postcard book. Another nice complete Sunfilms walking picture strip from the late 1920s. Although the firm worked mostly around Clacton, they also had operators elsewhere (including the Isle of Wight). I cannot identify the location here. However that does seem to be a viewing area to the right, probably looking out to sea. If it rings a bell with anyone please get in touch. As with other strips like this I have also had a go at animating the strip, and also added a bit of colour. There is more information about Sunfilms on the site, and more examples in the book Go Home On A Postcard. While my research is mainly focused on British walkies on this site I am aware the trade was worldwide. But recently we were sent scans of two walking pictures taken in Russia, the first I have seen from that country. They were sent by Aleksey Kononov (we share a fascination with the history of rock group Deep Purple!) and show members of his family, out for a stroll in the sunshine in Leningrad back in 1962. “There is my mum (in a light headdress) with her father (my grandpa) and sister (my aunt), and also there is grandpa’s friend.” The city is of course known today as Saint Petersburg, and both pictures were taken on the same trip. As well as showing that walkies were part of Russian street life, what fascinates me is that if you compare these with walkies taken in Britain at the same time, there is very little difference whatsoever. They could have been taken in Skegness or Bridlington. So at the height of the Cold War, this was after all the year of the Cuban missile crisis which I can recall as a child, ordinary people were out enjoying the same experience in Russia and Britain. And walkie cameramen were there to record the event. Walkies taken in towns away from the coast are far less common and often difficult to identify. London appears to have had a number of photographers at work pre and post-War, but many seem to be small operators and have proved hard to research. Out of the 100s of walkies I have collected or been loaned only a dozen were taken on the streets of our capital city. Sometimes though the image gives a few clues, and this pair of walkies both have London buses in view. Yet while the routes are often well documented, the walkies could be anywhere on those routes. The unknown lady in the first is being passed by a No. 6 to Kensal Rise Station, and certainly looked late 1040s or early 50s to me. The postcard sized glossy paper is ex-military war surplus too. I sent the scan to London bus expert Ian Armstrong who quickly replied to say that the fleet number RTW444 on the engine cover dates it to post-1951 (when the bus was allowed on this route) and pre-June 1953 when it was taken off. Few unmarked walkies can be dated so closely. Adverts for an unidentified brand of Swiss Roll can be seen on the front of the bus which might be worth looking for in magazines of 1952. The woman looks like she might be an office worker or secretary, perhaps on her lunch-break, as she only has a short handled handbag ovr her arm. At first she seems to be just rushing by but when you look closer you can see her eyes are looking at the camera and she is beginning to smile. Moments later she must have stopped to collect a ticket off the cameraman. How London walkie operators managed to get their potential city customers to return later and buy a print I don’t know, beyond clever patter! They did not have kiosks, so probably worked from a local shop. And being based locally it is more likely the customers kept the photographs, rather than walkies taken on holiday which have often travelled or been posted off. The second London walkie shows a pin-stripe suited gent who appears to have been rather worn down by city life, and perhaps the struggles of the war years. The bus behind him is on the 9 route to Mortlake, which was rather more central. The fleet number could again just be seen on the inside of the bus entrance and Ian Armstrong confirms that it must be taken after December 1944 and before June 1949. It’s a smaller half postcard sized print, but despite the gent’s less than likely looking appearance as a customer he has purchased the walkie. There are more London walkies on this site, and in the book and if anyone has more do get in touch. You cannot argue with that, as this couple stroll down Lumley Road in Skegness towards the esplanade and beach one August lunchtime. He has the popular white leisure shoes, regulation ciggie in one hand, and rolled up paper, and she has bathing gear wrapped in a towel. What makes this informal walking picture find useful is that has been dated in pen August 1933 on the back, with Wrate’s Harrington Gardens address printed on as well, which helps us pin down their move to open a new studio there and other similar cards by the firm. The history of Wrates is covered on this site and more examples of their excellent walkies appear in the book Go Home On A Postcard. It is very difficult to replicate the shot today as so many of the old houses have long since been coveted into shops and amusements. Sunfilms walkies continue to generate as many questions as answers, and we have yet to fully understand their operations. So each new Sunfilms find which is dated or has the town written on by the owner helps to unravel the story. This frame from Lindsay is one such, as she identified the location for us as Bognor. I did a street view search and it turned out to be London Road, the main shopping area (now pedestrianised at this point). But it has changed so much it is quite hard to match on street view, even the church has been pulled down (in 1972). So I did a search for old photos and turned up a nice view of the road from the late 1950s which did correspond exactly. I’ve shown the photo below and added the family in to the version at the bottom of the page. Sunfilms provided three frames on a strip using old movie cameras in the Thirties, and Lindsay dates this walkie to 1933 which ties in nicely. The photo shows her grandparents on the right while her father is the older lad helping with the push-chair; well one hand on the push-chair, the other holding a cornet! Lindsay scanned me three complete strips which are not easy to find – most people just cut them up – and they will feature in the walking pictures book. This then gives us a new location for the firm to add to the others we know about, but I suspect there will be more to find. What we do know about Sunfilms is on the site, and do get in touch if you have any of these strips.